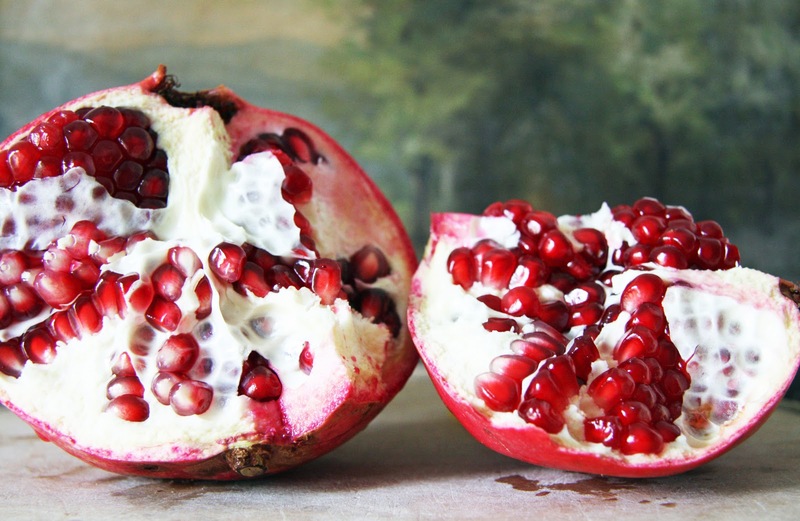 'Tis the season for the beautiful pomegranate. I remember eating pomegranates as a child. My mom would break one open, pull out the bread board under the counter (remember those) and my brother and I would stand there and gobble up all of the juicy seeds. Perhaps because they're a fruit from my childhood, they are a favorite fruit of the season. We eat a lot of pancakes in our household, but I have an extra spring in my step when we have pomegranates to enjoy with them. It's such a special treat. I've posted about Hubby's spelt pancakes before and just have to reiterate how delicious and fluffy they are (the trick is whipping the egg whites). Combine dry ingredients in large bowl. Whisk wet ingredients in a small bowl. Whisk egg whites separately in another small bowl until frothy. Combine together with dry ingredients in large bowl. Yum! I just bought a pomegranate at the store the other day... you are inspiring me to do something interesting with it! What a beautiful pomegranate! Do you submerge it in water to get the seeds out or do you hasn't have a better method perhaps? I like to peel mine all at once too and right now I have a large juicy one waiting for me in my fridge...now if I will just take the time to do it! The pancakes look yummy! Will have to try them! Omg did you take these photos? If so, incredible! I love everything about pomegranates. I use them in salads, martinis, champagne, etc. They are yummy and so pretty! Yum, I love pomegranates too. Must try your hubby's pancake recipe. We eat a lot of oatmeal pancakes here. Beautiful photos!! 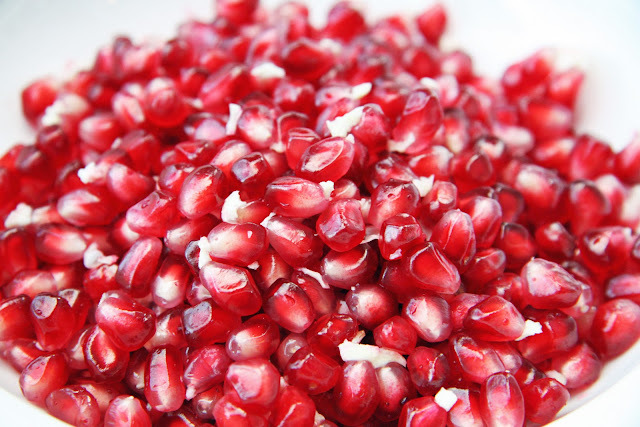 Pomegranate seeds are beautiful. I love your first photo. I didn't discover this fruit until a few years ago, and there is something fascinating about the taste and texture of those juicy seeds! I'll have to give your pancake recipe a try. I've never used spelt before. Would regular sugar work in place of raw sugar? I love making pancakes on Sunday mornings. I just posted my favorite pancake recipe, banana-walnut, on my blog this week. They're made from half whole wheat flour and half regular flour, and nonfat milk/yogurt (or use buttermilk). If you give them a try, let me know what you think! You make everything look good! Now my hubby is a man among men. We've been married 30 years and I really don't have any complaints ... except he watches too much football. But when I see your hubby doing home improvements, and making spelt pancakes, I think to myself, can we clone this guy? Beautiful pics as always. Regular sugar works fine too. I bought pomegranates a couple of weeks ago but I then discovered that they were not fully ripe and I was left with such a feeling of disappointment. So, I feel quite uplifted today to find your delectable portrait of a jewel-like fruit. It puts me in mind of a renaissance still-life painting. The pancakes look wonderful too. At first I thought, surely this is not a painting, it's too exquisite, then I realised it was a photograph - beautiful, such detail...love pancakes (we call them flapjacks in South Africa) delicious served with blueberries or as you have here, pomegranates! I've got to quit reading your food postings first thing in the morning! Looked delicious but now I'm going to have to fix some breakfast! I have looked at and held a pomegranate in my hands but I have never tried one. You, and these gorgeous photos have inspired me. Do you have advice on how to choose and what to look for, to find fresh ripe fruit? The feature of your Christmas home in Country Living is lovely but it is nothing like making a visit to A Country Famhouse regularly. Each visit brings fresh ideas and a view of a beautiful, genuine family. I feel "best" after a visit with you . . . I also have fond memories of pomegranates - I have a strong memory of eating them outside with neighbourhood friends, the juice dripping down our sleeves - then getting into trouble for getting the sleeves red -lol. Another great photo shoot. You are very talented. A work of art...that pomegranite is! I remember eating pomegranate as a child too! I haven't thought about that lately. Thank you for the reminder. I loved them as a child, too. My grands don't like them much....wonder why? I don't have much experience with pomegranates but after seeing your lovely photos, I want to eat one! Thanks for expanding my horizons. Your photography blows my mind! Just beautiful. This is a fruit from my childhood too. Mother did the exact same thing. This fruit seemed more special than the others...perhaps it was the season or maybe the process that made it so good! 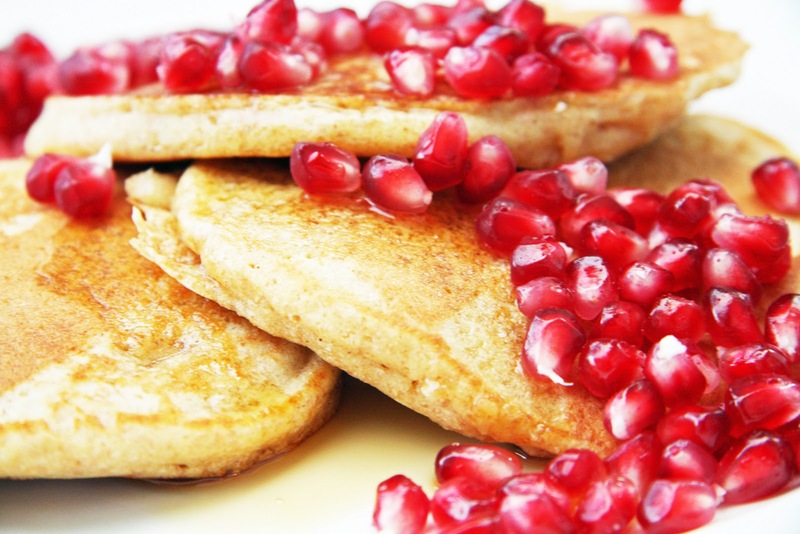 I have tried your husband's spelt pancakes recipe and they are wonderful! Thanks for posting. Thank you for this post. This was a memory from my childhood too—I loved all the little seeds rolling out. Such a fun treat to eat. Thanks for this post and the beautiful photography. I've never eaten pomegranates - only had them in juice. I know how good they are for you and you've inspired me to eat them. Will try your hubby's pancake recipe. Congrats on the appearance in Country Living Magazine. Love your house! I hope you know this post made my mouth water! Hi there, I too have many memories of eating this juicy fruit as a child. I still try to get at least one each year and now I sprinkle them on salads-they are so yummy, even with quinoa. Thanks for sharing your hubby's recipe. What gorgeous photographs and looks like a must try recipe, Trina. Happy December! Gorgeous photos...I must try these...whipped egg whites? Looking back once again...that first photo looks like s still life painting! I am planning on making these for my family on Saturday morning ... I can hardly wait! Beautiful picture, makes me want to paint it. I just bought my first pomegranite of the season and can't wait to eat it. For some reason we've never had them with breakfast...such a refreshing idea! I bet they'd be great on oatmeal too...now you have me thinking! These look gorgeous. I haven't had pomegranate since I was a child. I remember there being a small seed that I spit out. Am I wrong about that? Or are you supposed to eat them seeds and all? Just found your blog-and like yourself, I too went through that hideous hell called infertility. Ans yes, we also had twins born in December! I am happy to say that all these years later that they are still each others' best friend. It's awesome. I love your blog and your photos, very beautiful and inspiring. that first photograph should be a painting!! beautiful. Looks so delicious. Can't wait to try the hubby's pancake recipe for a lazy sunday morning. I too, wanted to know your seeding technique! The reward of those brilliant seeds is so great that it's worth a bit of picky work and stained fingers- but I'm always wishing there was an easier way to get to the fruit. Like Gail said, submerging in cool water helps! I cut off one end, score the outside, and let it soak until it loosens. Just tucked myself into bed with today's delivery of Country Living. What a surprise to see you in there! Pomegranate is the first tree I planted at our new/old cottage. Now I have two and I never tire of them. I really love them on salads, especially on goat cheese. Congrats on the magazine feature Trina. I'll have to look for a copy with your home on the cover! Love your blog and pics of your 'sweet peas'! This is inspiring and seems delightfully delicious ! 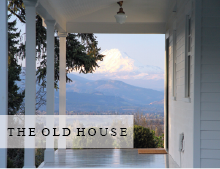 Congratulation on your soulful home being featured on one of my favorites magazine ! Enjoy a warm and gentle season ! I just made the pancakes they are wonderful, my 8 year old granddaughter thought they were delicious. Thank you for sharing the recipe they will be a regular in our house. I have also decided to plant a pomegranate bush at my house in the spring. Thank you for the inspiration. Your post brings back so many similar memories of eating pomegranates with my sisters when I was young. I was at the grocery store and found a plastic circle with holes called a pomegranate seeder. It was 3.99 so I decided to give it a try - well it really does work! Its so easy now to extract the seeds. Bought one for my sister too! Happy Holidays!! These look delicious...love decorating with pomegranates at Christmas too!! Yum....I remember the Autumn treat too...love pomegranates... now the stains stress me out a bit....fun to eat over the sink though. I've always been intimated by pomegranates and their messiness, but I think I need to get over it and buy some tomorrow. I need those pancakes in my life. Lovely post! I'm sure to follow you from now on!!! Oh my mouth does water for these thanks for sharing. So happy to meet you I have enjoyed looking around. I have just found your lovely blog. I'm now following you hope you visit me sometime, follow back if you like so nice to find new friends to catch up with. Have a great day. Hello! I stumbled here from Little Green Notebook and I just love your blog! I've really enjoyed your writing and the jaw-dropping photos of your beautiful home. I'm a fellow pomegranate lover and that first photo is just gorgeous. Take care!